Iddy is a mixed-media fine artist and painter specializing in stylized portraiture combining vibrant colors, patterns, and textures to make his pieces come alive. His use of brushstroke patterns and textures creates his unique style he refers to as “Basengoism”. 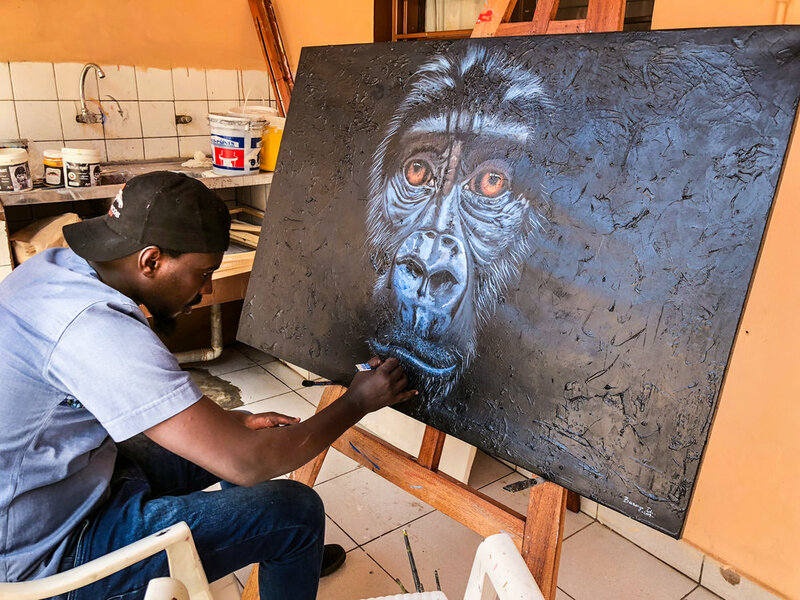 Iddy produced his first solo show, “See Far Go Far” 2017, at the Kigali Public Library and was a featured artist at the Envision Rwanda grand opening exhibition in 2018. Iddy’s passion and work ethic are inspired by his challenging upbringing, growing up as an orphan and who once was recruited as a child soldier for a Congolese militia. Luckily, in 2012 he was given the opportunity to attend the Agahozo-Shalom Youth Village, a boarding school for Rwandan vulnerable youth, where he developed his talent in the arts. Iddy graduated in 2016 and was the first fine artist to join Envision.